Such a cool tree for small gardens. Upright growing and then branches that also turn vertical fairly quickly- kind of like an upside down candelabra. 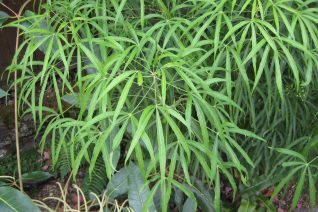 The lush evergreen foliage is composed of palmate divided leaves which droop gracefully and give the plant a lighter mein. In summer masses of orbicular off white aralia flowers appear en masse at the branch tips. They are pollinator heaven. And they turn into clusters of black berries consumed by birds. To 16′ tall and half as wide. Perfectly hardy to cold, but can become semi-deciduous below 10ºF. New leaves come quickly in spring. Fast growing tree for rich soil and regular summer water in full sun to high overhead shade in woodland conditions. This pretty tree has a promising future.